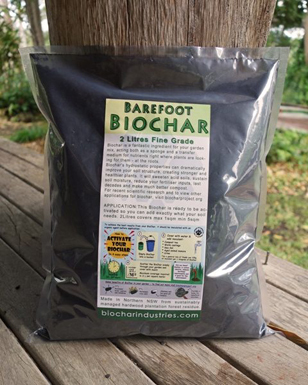 Biochar making on a budget. Welcome to my first episode : ) Right here is where you will learn some great ideas to help you get started making your own biochar. Lets get started I will let my pictures tell the Story. 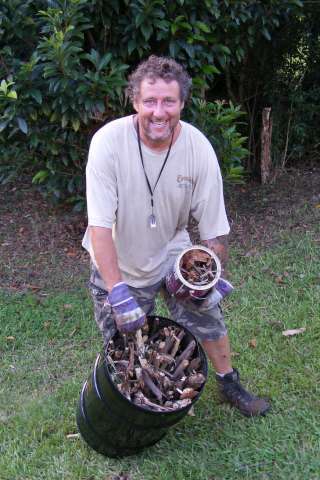 Biochar is good for the soil. When a soil is well balanced then it is good for your food. When your food is well balanced it is good for you. When you are well balanced you are good for the earth. When the earth is well balanced then I am happy. Next we need to fill her up with wood. 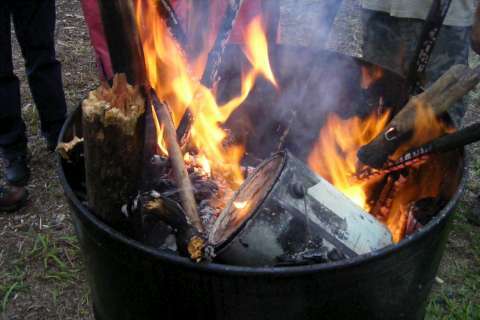 And fill her some more : ) after all we want the best biochar so we need to make the fire HOT. Lets look closer at the setup. Let her cook until the fire goes out. 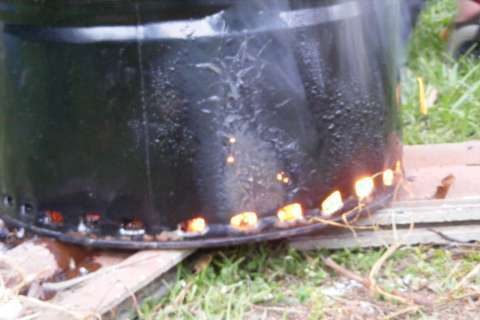 Then you can upend the big drum and retrieve the little drum that is 1/4 full of biochar. Look the little paint can is lit up as well. So now you have seen the photos I will run through the details with you. 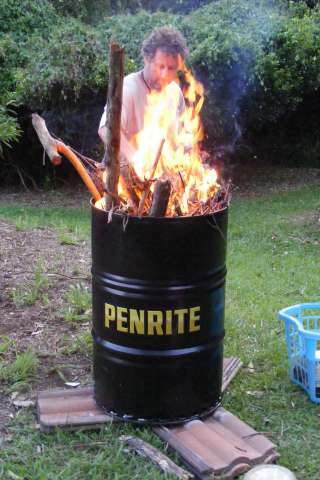 Cut lid off 205 litre drum then at the other end make holes around the bottom this will be our primary air to allow the fire to burn. 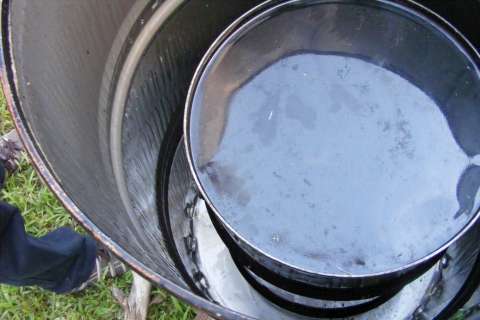 Now cut lid of the 60 litre drum and fill it with wood that you want to biochar. Note if you pack it with fine wood saw dust it will take a long time to pyrolize the same as if you packed it with big lumps of wood so rule here is to fill it with various size wood. Open your paint tin fill it with wood put the lid on and punch a hole in the lid. Now lay the 205 litre drum on its side and do the same with the 60 litre drum then push the 60 inside the 205 then lift the 205 upright again. 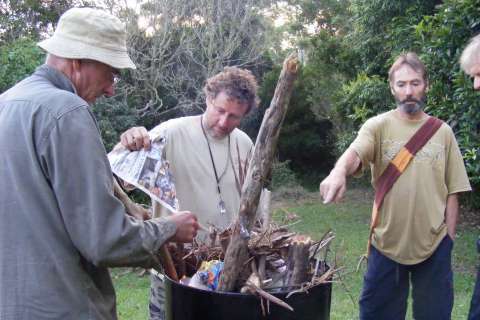 Stack around the 60 litre lots of wood to burn and then make a kindling stack at the top for easy lighting. Light her up and enjoy the attraction, warmth and experience. I would like to build one of the Adam Tort that you made. This Adam Tort is going to be build in a poor community in Dominican Republic. It will be wonderful if you can share drawing details of the brick Adam Tort that you build. I was looking the pictures you posted but there are few details I am unable to decifer. I would appreciate if you can share the dimensions and details of the chimineys. If you provide a telephone number I will be happy to call. If you want to call me I am available at 786 317 7857 in Florida USA. Thank you. Hello Juan I will pass your details onto Hugh he is in USA and I trust him to help you as he can. also here is what I can do for you. 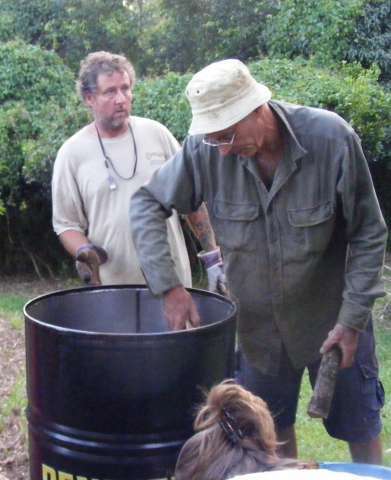 Next post: Biochar Basics Show on 28th of May Byangum NSW Australia.